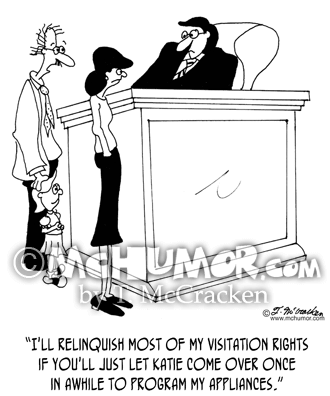 Divorce Cartoon 6485: A father of a six year old in divorce court pleading, "I'll relinquish most of my visitation rights if you'll just let Katie come over once in awhile to program my appliances." 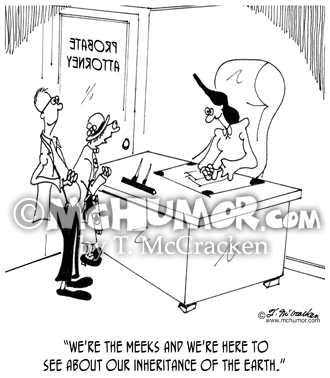 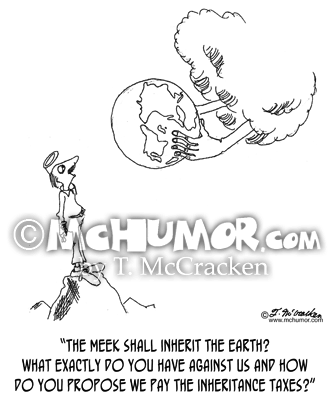 Law Cartoon 7126: A couple at a probate lawyers office saying, "We're the Meeks and we're here to see about our inheritance of the Earth." 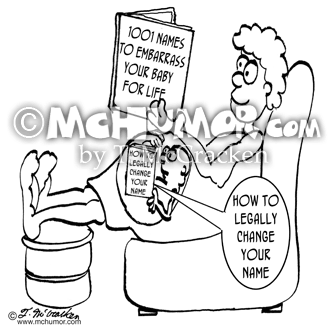 Baby Cartoon 2787: A pregnant woman reading a book, "1001 names to Embarrass your Baby for Life" while her fetus reads, "How To legally Change Your Name." 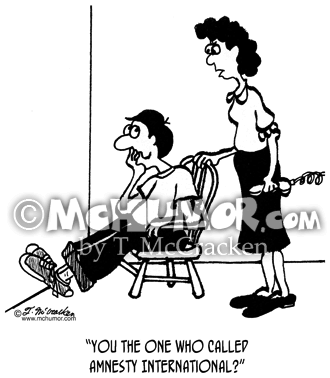 Kid Cartoon 4781: A mom with a phone in her hand says to a kid sitting in corner, "You the one who called Amnesty International?" 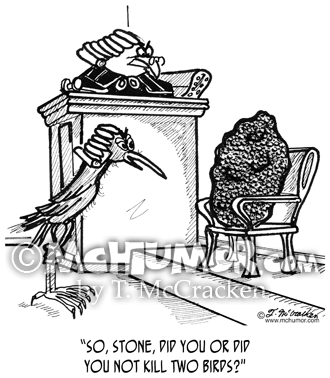 Bird Cartoon 2021: A lawyer questioning a huge stone in the witness chair in a court room says, “So, stone, did you or did you not kill two birds?" 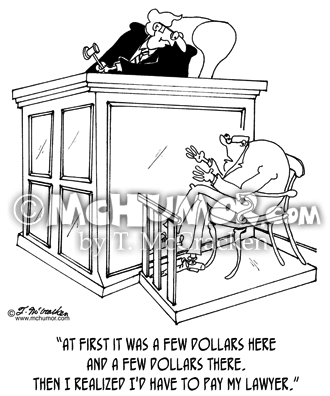 Embezzling Cartoon 5460: A man saying to a judge, "At first it was a few dollars here and a few dollars there. 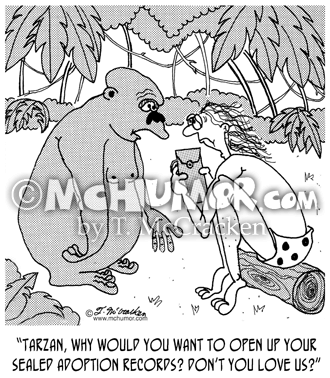 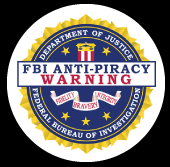 Then I realized I'd have to pay my lawyer." 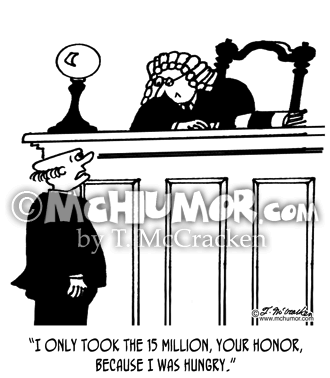 Crime Cartoon 3816: A man saying to a judge, "I only took the 15 million, your honor, because I was hungry." 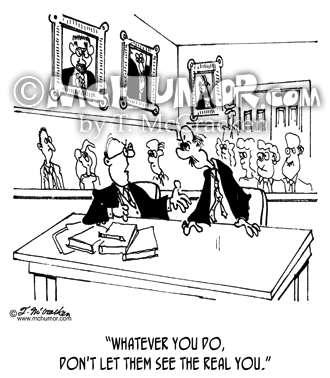 Attorney Cartoon 4970: A lawyer saying to his client, "Whatever you do, don't let them see the real you."